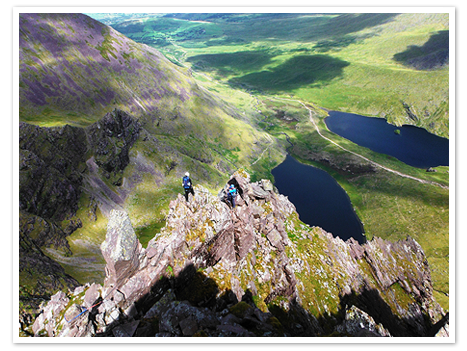 Howling Ridge is known as one of Ireland’s classic and famous multi-pitch mountaineering routes. 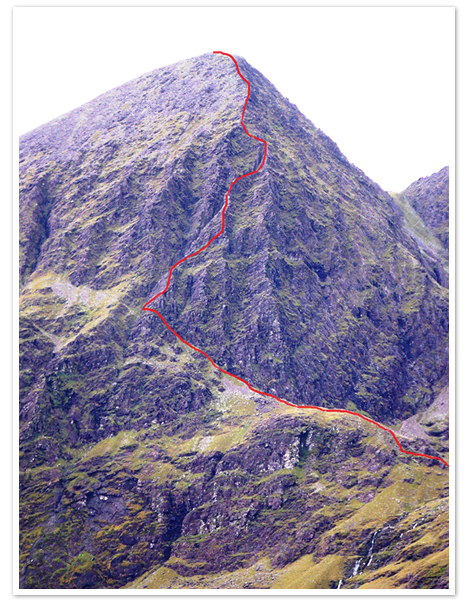 A steep, well defined ridge which cuts up the north-east face of Carrauntoohil. It is graded V. Diff in summer and goes at various grades in winter, depending on conditions. It is the central of three ridges high on the jagged North East face of Carrauntoohil. On its left separated from Howling by Collins’ Gully, is Pipets Ridge and to its right is Primroses Ridge. 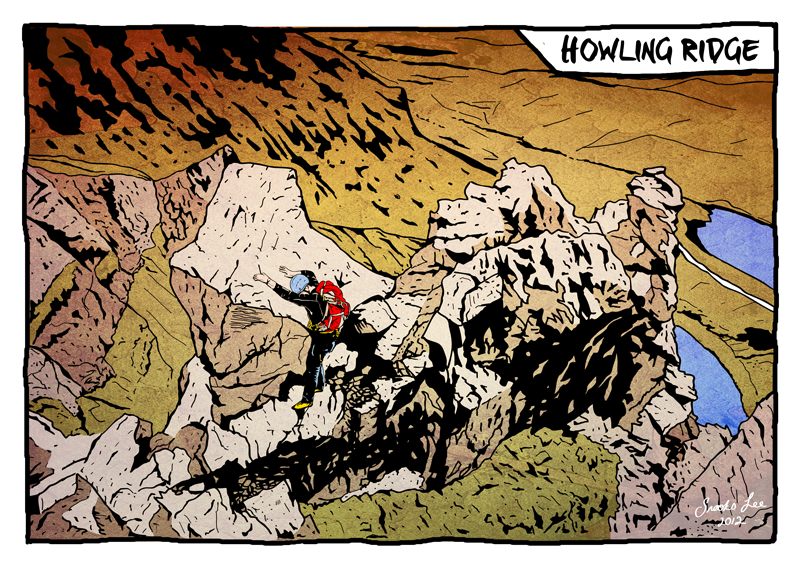 Howling Ridge starts at the lofty perch known as Céim an Fhia / the leap of the deer or more commonly known as the “Heavenly Gates”, the point where the narrow path traversing the NE face of the mountain passes through a notch and breach in the steep face. The first half of the climb is a series of steep sections interspersed with easier climbing. The most difficult part of the route is a steep buttress of rock high up on the face known as The Tower. 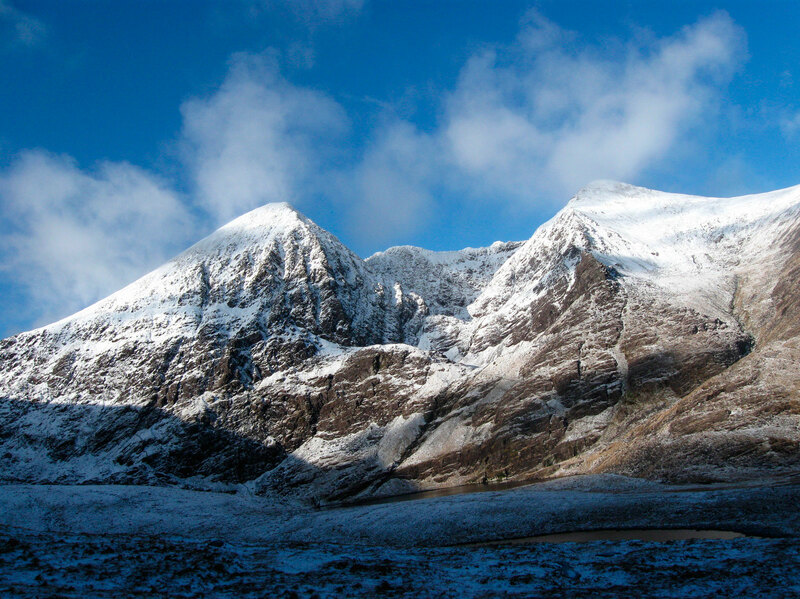 It was first climbed in February 1987 by two local mountaineers, Con Moriarty and John Cronin in winter conditions. The route gets its name from Cons dog – Grimsel who followed them in the glen and then waited at the Heavenly Gates, howling while the pair completed the climb. 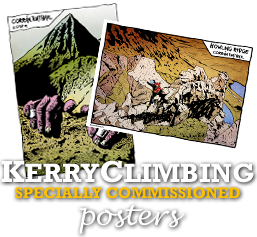 The climbing is not technically difficult but the constant exposure, potential wet and windy weather conditions, extremely loose and at times greasy rock, intermittent vegetation, and lack of escape options make this a serious climb. 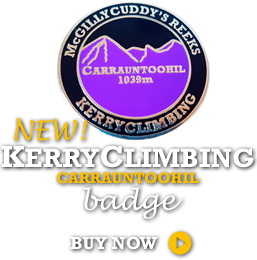 KerryClimbing have a 100% success rate on guiding this route and have literally climbed it 100’s of times in all weather conditions so you can be assured you are in the safest of hands. 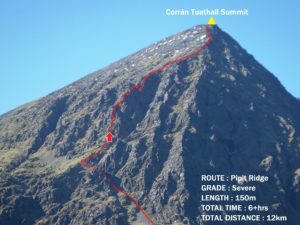 Steep, committing and exhilarating – an exciting and unforgettable route to the top of Irelands’ highest mountain!!! As this is a roped technical climb some previous Rock Climbing experience (indoor or outdoor) is a pre-requisite for this route but don’t worry, if you don’t already have this as we also run this as a 2-day course. On day 1 you will complete an Intro Rock Climbing course and learn all the skills needed for your exciting ascent of Howling Ridge the following day! A very good level of fitness is required and of course a head for heights is also recommended ! 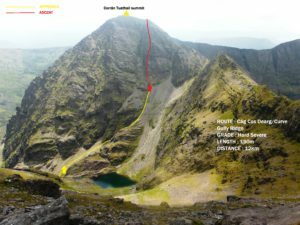 Carrauntoohil and the magnificent MacGillycuddy’s Reeks mountains contain some of the most impressive and finest multi-pitch rock ridges in the entire country. 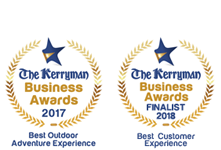 The steep North and NE facing cliffs of Carrauntoohil provide the very best of these and offer the mountaineer and climber some hugely satisfying and rewarding routes to gain the summit of Ireland’s highest. Howling Ridge is by far the best known and most popular but plenty of other fine and truly spectacular routes exist and share in the same exhilarating and brooding mountain atmosphere, towering above high hanging valleys, hidden coums and corries and steep sheer precipices. We guide many of these other sensational climbs and maybe after already ticking off the mighty – Howling Ridge you may now be tempted to take on the challenge of another dramatic Reeks ridge, this time perhaps a little steeper, more difficult and even more exhilarating! A fabulous route which leads right to the very summit. Approx 160m long and climbs superb rock. It traces a splendid airy line up the steep nose and narrow ridged crest towering high on the right above the steep narrow cleft of Curve Gully which when chocked with snow & ice is a fun and hugely popular line for Winter mountaineers. It may look imposing and daunting from below but there’s little to worry about on this wonderful climb and well rewarded for the slightly long approach. Pipit Ridge : This finely pinnacled and jagged toothed ridge climbs the steep North face to the left and almost parallel to its far more popular neighbour – Howling Ridge. 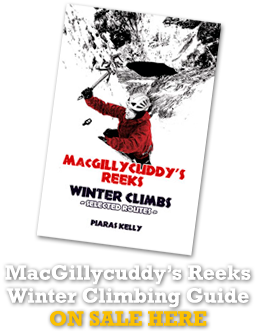 It provides slightly more difficult climbing than its far busier counterpart and contains some wonderfully exposed sections and leads to the top of Collins gully and then onto the final scramble section to the summit. Shattered but generally decent rock, good protection and awe-inspiring vistas and situations throughout makes this a logical progression after Howling Ridge.